~*~ Juz Mel: Part & Parcels of Life ~*~: i DoN'T nEED bUsY-bODiEs, dAndEnOnG tRiP, hEctiC tHeSiS -hAnDiN uP dAY & MiSsiN tuBBs + LeN tOo LaH..
i DoN'T nEED bUsY-bODiEs, dAndEnOnG tRiP, hEctiC tHeSiS -hAnDiN uP dAY & MiSsiN tuBBs + LeN tOo LaH..
Now, lets get back to better things. Just sent darling to the train station at Caulfield this morning, it's just along the Princes Hwy and takes only about 10-15 minutes. Thought it would be nice to have a quite drive back home alone after dropping darling off, but Nooo, it was raining on and off with the drizzles and pouring every now and then. So I got home and didn't feel like jumping back to bed and thought might as well do something with my blog. 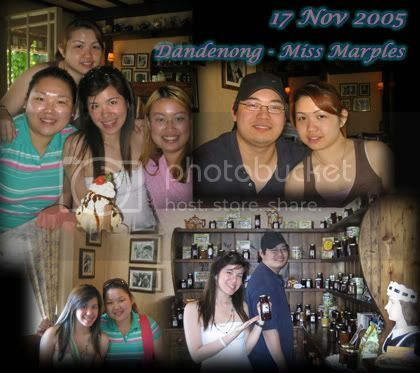 Well, so these were some of the stuff we took up at the Dandenong Ranges, the Miss Marples Tea Room. I think I've got the description and website in a previous post a few months back. Yess, the scones are absolutely awesome, but a couple of them is enough to make you feel bloated. Then there's the Vicar's Folly ice-cream as they called it, shown on the left shared by darling, Joewiz and Joyce. The Jam and cream for the scones were really good as well and a small bottle only costs around $6. The place has an old english feeling to it and it's really a nice place to bring your parents for tea and scones!! Oh yah, the place closes at 4.30pm everyday and is easily accessible by car only though. Lotsa tourist busses go up there too..
After that, we headed to the nearby shops and shown there is a pretty interesting shop that sells anything to do with tea. They have lotsa different unique and lovely tea pots, even miniature ones. 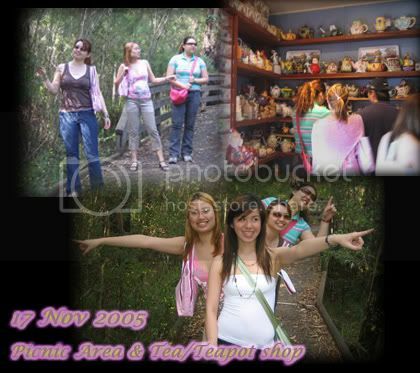 Look at the inquisitive people on the right, haha.. Then darling stopped at the picnic area for us to go down and take a walk and yah we had nothing better to do so we took some silly photos instead. Yes as you can see, the prettiest one must always stand in front right? :D She blocked my hand too! Yesterday was spent at uni trying to finish up the last of my thesis , printing and binding it. Thanks to Len, Joyce for their patience waiting and especially darling for driving me back all the way Gippsland and helping me with the printing and stuff. Gave Tina, Shelley and Simon a farewell gift for the help rendered. Plus Adrien, the lecturer I'm helping to mark assignments for gave me a box of chocolates for helping him with the extra assignments.